After making many headlines and making its users delighted, now here is something bad for Jio users. With the Prime users subscription and a monthly tarrif of Rs303, Jio have announced the Summer Surprised Offer, under which users who will subscribe for Prime Membership and do a monthly plan recharge with Rs303 or other will get 3 months free data and calling. If you are waiting till end to do a recharge then, it will be a bad idea now. 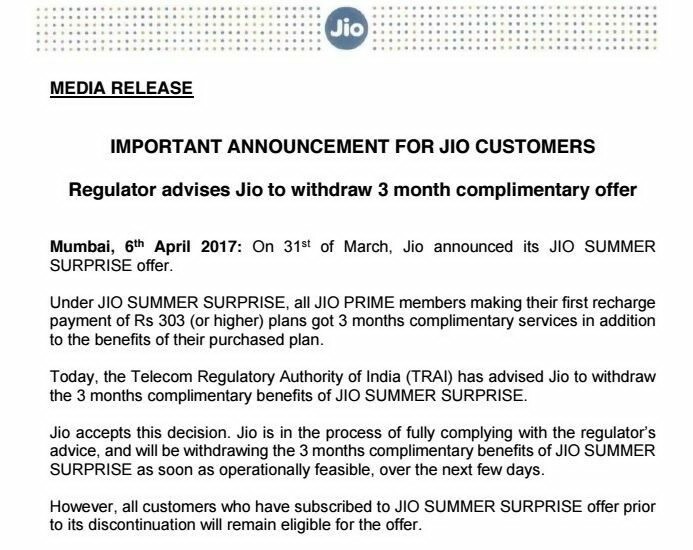 This is because Telecom Regulatory Authority of India (TRAI) has advised that Jio should withdraw their Summer Surprise offer. According to the sources, Jio may withdraw this Summer Surprise Offer in next 24 hours. So now don't wait for last day, do it now only. Except from this, good news is that users who have already done a recharge of Rs303, and above will be able to get the complementary benefits of the offer.